The time has come to set the record straight. While the use of dynamic SQL in vendor packages continues to rise at a steep rate, the perception of most DB2 professionals remains that dynamic SQL is complex, resource-intensive, and difficult to manage. How true are these perceptions? 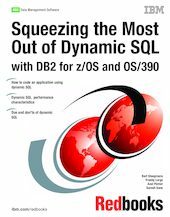 This IBM Redbooks publication investigates some of the myths and misconceptions surrounding dynamic SQL. It presents a balanced discussion of issues such as complexity, performance, and control, and provides a jump-start to those venturing into this somewhat under-utilized area. What is dynamic SQL? When is it appropriate? How do I develop an application in COBOL, REXX, Java with JDBC, or C using ODBC containing dynamic SQL? How do I obtain the best performance from it? Should I use dynamic statement caching (and if so, which flavor) for my dynamic SQL statements? How do Enterprise Solution Packages packages exploit dynamic SQL? How do I manage and control it? In this book, we focus on these and similar questions as we show you how to maximize the benefits that can be obtained by using dynamic SQL in your applications.